Permit me to express some rare sentiment here. Usually, the theme of this blog is either intellectual-slash-scientific (when I cannot help but lecture about topics in linguistics), anger management (when I am ranting about my rowdy students), domestic (when I am blogging about my day-to-day life), or plain trivial (when I blog about things that surprise me, such as the sagging fashion statement by many guys here, etc). But today, let me do something different. Let me blog about my family. The motive of this is my conversation with my parents about an hour ago thru Yahoo! Messenger. As it is, they are preparing for their move to Prague, Czech Republic, from Vienna, Austria. So for them, everything has been in boxes now. And tonight is the last day that their computer would be around. Starting tomorrow, it would also be packed and wouldn't see the light of day until they unpack in Prague. So our conversation today was a bit more than the usual trivial. It is weird to think that somehow, I feel closer to my parents now, now that I am physically thousands of miles away from them, compared to when we were living together, all four of us, in one roof. I guess I never realized how important they are to me until I moved here. I guess I took their presence for granted. As my mother laughed on the jokes that I fondly crack for her earlier, it reminded me that life wasn't always funny for us. I got into big trouble a number of times while I was growing up. The first serious trouble I could remember was when I discovered video games when I was in fifth grade. I stole money from my Dad's closet just to fund my video game addiction. My allowance never sufficed. Of course, they eventually found out, and I received some harsh discipline for that. I still cannot forget the look of my Dad cry when we were sitting at the table, and he was giving me a sermon. My Mom should be given credit for the way she trained her children with regard to housework. I remember when I was in 4th grade, she started making me do the dishes. One Sunday, I remember she cooked beef stew, and the pot was so heavy and stained, it took me three hours to finish. Yes, I remember me standing in front of the sink from noon to 3:00 pm. Looking back, I now realize how important those periods of learning were. Similar events happened when I stepped into 7th grade, when I became the one responsible for washing and ironing my own clothes. She would separate our clothes, because she wouldn't wash my clothes anymore. We would have to find time and do the chores ourself. The same goes with my sister. Ironing is no different. My mother showed me the proper steps in ironing shirts, pants, everything. Now, I memorized them the way I know how to tie a necktie round my neck. And now that I live alone, those skills are indeed very useful. Cooking was also another learning area. Starting when I was in 10th grade, she would make me plan the family menu for at least one meal a week, which was typically a Sunday lunch. I am responsible for preparing the ingredients, sometimes, a day before, and I would cook it by myself, and she would hover around the kitchen making sure everything is in proper order. I remember, one time I decided I make Indian Chicken Curry. Everything was ready, except I forgot to cook the rice. She never told me, even though she knew that I am forgetting something. I only realized my mistake when I called "Table is ready" but I glanced at the rice, and lo and behold, it was not yet cooked. Now, I don't have a hard time feeding myself. Those are just some of the things that linger in my head, which makes me grateful for what I have become. Without my parents, I never would have found myself in this disposition. The picture above was the last picture taken that included all four of us. It was taken inside the Viennese tram. That is my Dad and Mom in the foreground, and my sister in between, and me standing at the back. 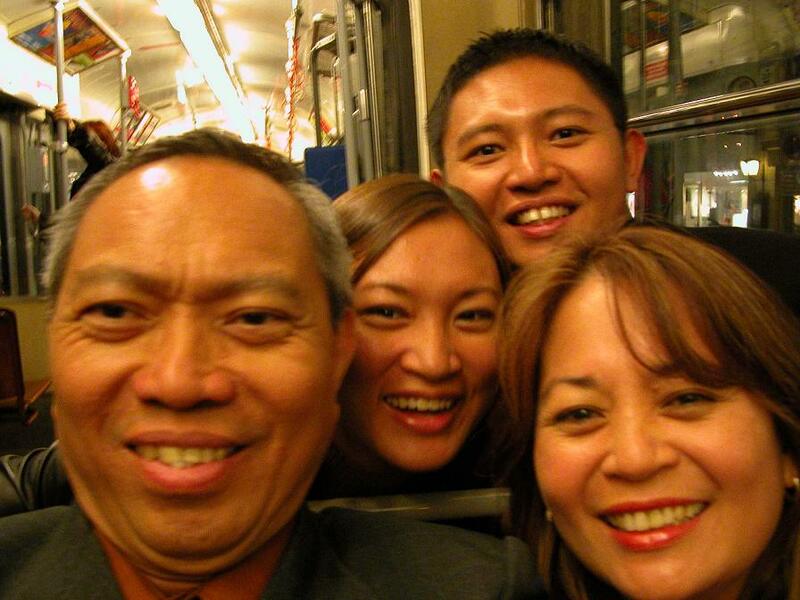 Me and my sister were on our way to Vienna International Airport to fly back to Manila, and my parents are seeing us off. As of now, I don't know whether there will be another occasion like this in the near future, whether we would still find the four of us in one location in the world. But even if we are spread and scattered across continents and oceans, the family is closer than ever, if not physically, but in spirit. I can see how that's better than the easy life kids get these days, where everything is handled for them. You're right to appreciate it! LIW, that's a wonderful, impressive family portrait!!! This afternoon I visited for a short time your site too for checking out your new entries. I thought about your pic: "What a nice family!" Now I return and I think again:"You look so lucky and your family too!" ...cause our family has in spite of the separation of me and my ex-husband ( we live in a distance of only 500 m in the same little town) a strong connection too. Our family simply enlarges - I think in some time everyone of us will have a (new) partner and then the original family of 4 people has enlarged to 8 people. A family is very important - you are so right! You are lucky indeed to have such a wonderful family. What a great family you have! My parents also taught us the importance of responsibility/accountability at an early age. When I was 5, I was already tasked to set the table for our meals. My assignments became more complicated over time from doing the dishes to scrubbing the floor to running errands, etc. That's a lovely post about your family. I like the picture too. I think one of the greatest gifts parents can give their children (besides love) is teaching them to be self-sufficient. My parents did the same as yours. By the time my brother and I were teenagers we could do our own laundry, clean the house and cook a prety good meal. These skills have stood me in good stead ever since and I thanks may parents (especially my mother) for teaching me these things. My wife has always apreciated it too ! you are very lucky to have a loving family who brought you up to be a responsible person. that is the most wonderful tribute I have ever heard! It is so true as we grow up and realize that everything that may have pained us in earlier life definitely paid off when we got older and we appreciate so much more now. You family is definitely blessed to have such a wonderful son who has an amazing head on his shoulders. It is truly a pleasure to have met you on here. It is awesome that you all are still amazingly close even though so far away. Keep that it is on to treasure!